Jessica has soome fabulous polishes. Looking forward to this collection. I wish Jessica had coupons or sent more polishes out to you top end bloggers for swatches, it's so hard to pick them on her site. I don't have any Jessica - I will have to look up where they are e-tailed since no one around my end of the boonies would carry these. I feel I am missing out! This collection looks interesting - but I need to see swatches!!! I adore Jessica polishes, I love their collections! I'm sure I'll get a couple of these, probably Vampy Vixen and Showstopper! 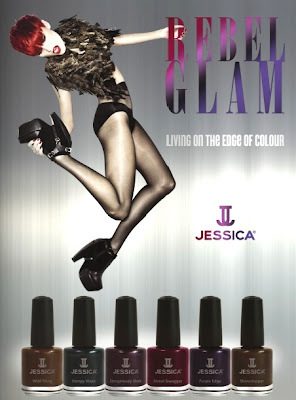 loooovely fall colors ... can I buy Jessica online somewhere or where do you guys get this brand? Caitlyn~you can purchase it from their site, jessicacosmetics.com. I've also purchased their older shades from hello-gorgeous.net. I wish they were more readily available, because they have such a great formula and many gorgeous colors. Oh wow! These look like just my kind of colors; perfect for the fall!